Help 2 lovestruck but penniless cats finance an unforgettable wedding. To afford caviar, you'll need cash! 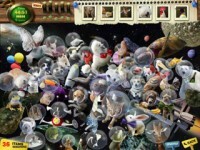 Earn it as you uncover hidden objects! Felicity and Mr. Bones are in love, but a cat's budget is tight. Select and buy items for their wedding with the money you earn finding hidden objects, solving puzzles and playing mini-games. The eccentric Larry will help you along the way, as you rummage through his cluttered House of Wonders and discover the oddities within! Prowl the zany House of Wonders and discover what's hidden! Solve puzzles and tempt fate at Lucky Larry's Casino! 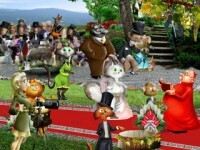 Tell someone about House of Wonders: Kitty Kat Wedding Game!